Three special episodes of Inferno Cop. The first features cameos of characters from Little Witch Academia. 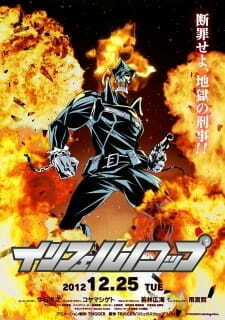 The third episode involves Inferno Cop traveling to New Jersey, where he comes across Donald Trump. The short first short was aired at the 2015 AnimeNEXT and Anime Expo conventions. The second was screened at the 2016 AnimeNEXT convention. The third was screen at Anime Expo 2017. Update: There are two reviews for this. The first one is from Anime Expo 2015. The second is from Anime Expo 2017. Let's be real. Unless you were lucky enough to get into the Trigger panel at Anime Expo (AX), AnimeNEXT, somehow hacked into the Trigger staff's computer and stole the mp4 file, or these shorts were released already without my knowledge, you will probably never see this for the rest of your life. As such there can never be a real review of these special episodes. All you need to know is that for those of us who saw it, such as I did at AX 2015, it was probably one of the strangest, stupidest, and greatest things we saw at our respective conventions with the entire crowd laughing and cheering at the strange ways Trigger merged Inferno Cop with Little Witch Academia. HAIL DARK LORD AUNTIE GRENDA! Well this time around people have managed to record the panel. You can probably find it online if you search hard enough. I wasn't there at AX this year, but my thoughts are more or less the same as above. Trigger really outdid themselves by incorporating a live choir. Good job Trigger. Shared universes are a long-standing tradition in American comics and now all the rage in movies, but relatively rare in anime and manga. This has made Space Patrol Luluco - a series that's combining Studio Trigger's various other series into a single story - all the more unusual and exciting.